The MVT Hydraulic Elevator is a time proven classic product with many years of built-in experience providing more ride comfort and simplicity in design, installation and maintenance. With all our elevator products, the customer is in the center. The MVT trademark is the custom designed and custom adapted elevator. It does not need to cut corners like a standard product nor force the installers to standardize or modify the hoistway only to suit a particular elevator design. We build around what is best for the customer and the elevator installation. This principle has given us a variety of applications where each application will meet the closest need from the building owner, architect and installer. The installation is the most important phase to meet budgets and cost estimates. MVT recognizes this fact and delivers the hardware with detailed installation drawings, easy labeling and assembly instruction and all documentation for adjusting and inspection of the elevator. Important is to know that all our components are non-propriety with no restrictions for the installer or service company. The newest technology is brought to the market by MVT, making the hydraulic elevator a serious competitor to low rise traction and MRL systems. This includes the introduction of counterweights to improve efficiency and to reduce the size of all components and the micro leveling feature for smooth re-leveling with minimum power demand. Our power unit with the air cooled vertical motor eliminate heat issues and the electronic valve allows the best ride quality with it's closed loop circuit. 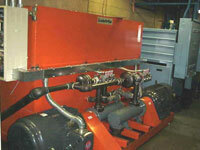 MVT has over the years designed and manufactured hydraulic elevators for every possible application. This will include everything from single 2-3 stop twin post to large freight elevators and car lifts up to 60,000 lbs. The close contact between our engineering team and the customer allows for flexibility and quick decisions when required. With warehouse and service parts in the NYC region, shipping and transportation is easy to most parts of the country and Canada. We invite you to look at the various applications and examine how MVT can facilitate your next installation.